If you're looking for great value parking at Birmingham airport, book one of our Birmingham airport Park and Ride car parks. They're usually our best value car parks at Birmingham airport. With prices starting from just £42.00 for eight days' parking, you don't want to miss out on our great deals. You'll always save money if you book your Birmingham airport parking in advance with us. 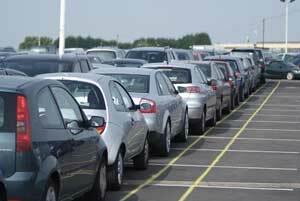 At any UK airport car park, if you turn up without having booked, you'll pay more for your parking. We can save you up to 60 per cent on the gate price. Our Birmingham airport Park and Ride car parks are all close to the airport and very convenient. You just drive to the car park, park your car and catch the transfer bus to the airport. When you return from your holiday, the transfer bus will take you back to the car park to pick up your car. Transfers are included in the price and are provided 24 hours a day. We've two Park and Ride car parks at Birmingham airport: Airparks Birmingham and Long Stay Birmingham. At Airparks Birmingham, your car is parked for you, so you can head to the terminal straightaway. Transfers take 15 minutes and run every 25 minutes. Birmingham Long Stay is within the airport grounds, so it's just five minutes from the terminals. Transfers run every five to 10 minutes. Airparks Birmingham and Long Stay Birmingham are both fully secured and hold the Park Mark, a national security award accredited by the Association of Chief Police Officers. Both are regularly patrolled and protected by CCTV, entry and exit barriers, a security fence and lighting. After you've chosen your Birmingham airport car park, you'll have the option of adding parking upgrades to your booking. You can get traffic updates by text on the day you travel, sort out your holiday insurance and currency, and book yourself into one of our Birmingham airport lounges. At Airparks Birmingham you can also have your car valeted or book a room in one of our Birmingham airport hotels - a great idea if your flight out is very early or your flight back is very late.